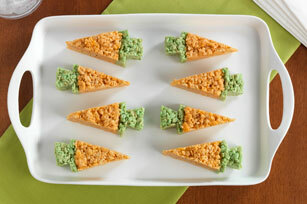 Your guests will be hippity hopping to the Easter dessert table to taste one of these cute, yet super easy, carrot-shaped treats. The Easter Bunny himself will be impressed! Microwave 2 Tbsp. margarine in large microwaveable bowl on HIGH 25 sec. or until melted. Stir in dry jelly powder. Microwave 15 sec. ; mix well. Add 3 cups marshmallows; toss to evenly coat. Microwave 1-1/2 min. or until marshmallows are completely melted and mixture is well blended, stirring after 45 sec. Add 3 cups cereal; mix well. Press cereal mixture into 6-inch circle in centre of 8-inch round pan sprayed with cooking spray. Microwave remaining margarine in separate large microwaveable bowl 25 sec. or until melted. Add remaining marshmallows; toss to coat. Microwave 1-1/2 min. or until marshmallows are completely melted and mixture is well blended, stirring after 45 sec. Stir in food colouring. Add remaining cereal; mix well. Press to form rim around cereal mixture in pan. Cool completely. Cut cereal mixture into 12 wedges to resemble carrots. Remove from pan. Use sharp knife to cut out small notches on both sides of each carrot top to resemble photo. Add 1/2 cup boiling water to remaining dry jelly powder in medium bowl; stir 2 min. until completely dissolved. Stir in 1/2 cup cold water. Refrigerate several hours or until firm.